I have mentioned it here before but a couple summers ago (well 9 summers ago but it seems like yesterday) I was fortunate enough to backpack around Southeast Asia. The timing worked out that both my husband (then fiance) and I could take the time off and get lost in Vietnam, Laos, Cambodia, and Thailand. The trip will always be one of my favorites for many reasons, but one of the main reasons was the culinary awakening I had during our travels. We ate so many new flavors and new dishes that I completely fell in love with all of the Southeast Asian cuisine. We had many food moments that were life changing but one in particular was our first banh mi sandwich in Vietnam. It was a steamy summer night and we were walking through a hot and smokey night market. We grabbed a sandwich, a glass of theVietnamese beer Tiger and with nowhere to sit, we found a curb. On that curb we proceeded to eat one of the most delicious sandwiches ever. The banh mi in Vietnam had tofu, pate, pickled vegetables, herbs and the perfect amount of spicy mayo. To this day I still remember how incredible that sandwich tasted - I think it was a combination of new flavors, cold beer and being outdoors on a hot summer night. Since it has been way too hot here in Nashville to turn on my oven or stove, I thought we would have dinner al fresco this past weekend and make dinner on the grill - because everything tastes better when eaten outside on a summer night! Inspired by that banh mi sandwich all those years ago, I decided to recreate that summer evening by making banh mi on the grill with the La Brea Bakery French Baguette. Since French cuisine is rooted in Vietnamese cooking, getting the perfect french bread for banh mi is half the battle and the La Brea Bakery French Baguette has the perfect consistency - crunchy on the outside and chewy on the inside, just like the bread we had in Vietnam. I love the take and bake option too because it allows me to finish cooking it in the oven when I get home for the freshest bread possible. I decided to grill both the tofu and the bread because it added the perfect amount of smokiness. In addition to the tofu, I stuffed the baguette with pickled vegetables, fresh herbs, spicy mayo, and a drizzle of fish sauce. The end result was the most delicious sandwich that brought my husband and I right back that sweaty and smokey night in Vietnam where we were first introduced to the banh mi. First I decided to skip the pate but feel free to add store bought pate in there if you so desire. If tofu is not your thing, consider swapping it with grilled chicken or pork. Lastly, this sandwich is best eaten al fresco, on a hot summer night with an ice cold beer. Place the carrots, cucumber, and jalapeno in a heat safe bowl or jar. Bring the vinegar, salt, and sugar, and 3/4 cup of water to a boil, reduce heat and stir until the sugar and salt have dissolved. Pour the vinegar mixture over the vegetables. Let come to room temperature and chill for at least an hour or in the fridge for up to a week. When ready to make the sandwiches, slice the tofu into 1/2" thick pieces. Lay the tofu on a paper towel lined sheet tray (or any flat surface) and cover with paper towels. Place another sheet try on top of the tofu and allow some of the liquid to drain off of the tofu. (If you don't have another sheet tray use a flat surface that is not too heavy, we want to apply pressure to the tofu but don't want to smush it). Let the tofu sit for about an hour then place in a shallow dish. Make the tofu marinade by combining the garlic, ginger, lime zest and juice, fish sauce, and vegetable oil. Pour over tofu and allow the tofu to marinate for at least an hour or up to overnight. Pre-heat a grill over medium high heat. Slice the baguettes in half and brush the cut side of the baguette with oil then place cut side down on the grill and grill the bread for about 1 minute or until bread is warm and slightly chard. Grill the tofu alongside the bread until the tofu is warm and slightly charred about 4 to 6 minutes, flipping halfway through. Assemble the sandwiches by spreading mayonnaise on both sides of the bread followed by sriracha to taste. Divide half of the tofu between the baguettes followed by the pickled vegetables and a handful of fresh herbs. 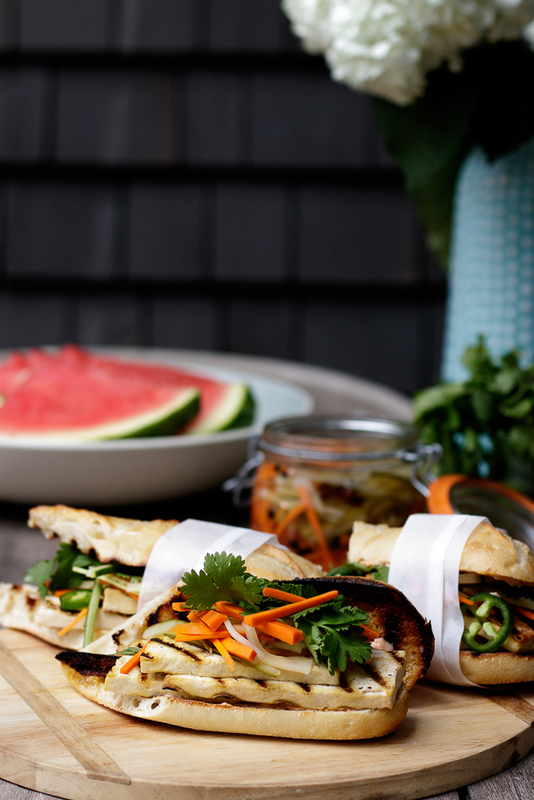 Serve banh mi with more fish sauce and sriracha to taste. **This post is sponsored by La Brea Bakery . All opinions are my own. Thanks for supporting brands that support me.